« Aïgal » is the name given to one of the winds that sweep across south-west France. The Ensemble Vocal Aïgal was formed in 2016 by six women whose vocal career to date had led them to conclude that, for them, operatic singing was unimaginable unless it was with a group, working together. The Ensemble Vocal Aïgal was the end-result of this philosophy, revolving around the one major theme of a desire to perform a cappella and deliver a simple expression of the female voice. The Ensemble Vocal Aïgal are an ensemble of soloists where each individual is at once a component of a musical whole but also a separate entity adding her own colour that blends perfectly with the five other voices. Their repertoire is as eclectic as the ladies themselves, crossing the ages and different genres but always with the guideline idea of music delivered through written scores. With scores in hand, these six young singers perform works from the so-called classical composers like Schumann and Poulenc, but also a more contemporary range with pieces by Veljo Tormis and David Lang. They also like to explore songs in more traditional colours. 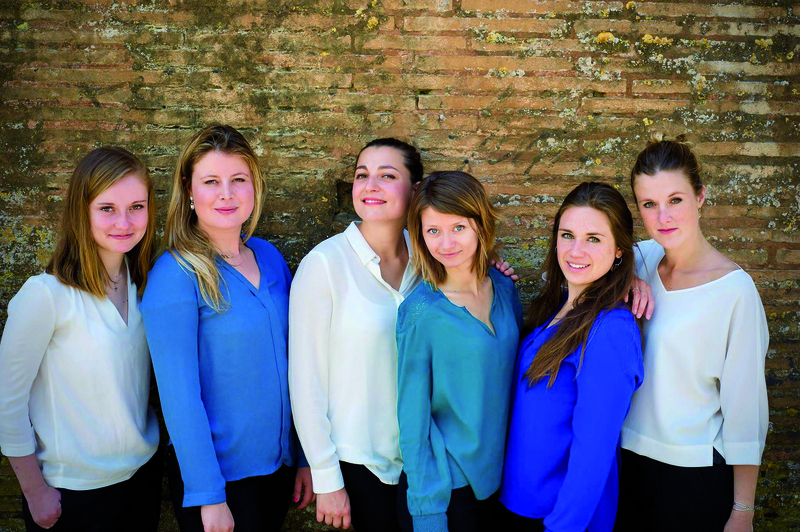 Marie Zaccarini, Astrid Dupuis, Lauriane Tregan, Caroline Roux, Julie Mathé and Camille Souquère met at the Conservatoire de Bordeaux while following an operatic singing course, where each student builds his or her own solo operatic repertoire. This individual work unquestionably strengthened the musicality and the qualities required for singing as an ensemble. They perfected their craft under the guiding hand of Eduardo Lopez throughout their studies and have also had the chance to work with Alexis Duffaure on a number of projects.